It's crazy how much trouble a kid that's supposed to be a superhero can get into. Just imagine if your child could go invisible any time she wanted. Bathtime would simply have to be optional. There's no way you could get a child with invisibility talents into a bathtub against her will. Then there's the issue of snacking. You wouldn't be able to unpack groceries safely without a packet of cookies going missing. You never see those cookies again because invisible children are awesome at hiding loot. Well, maybe you're grateful you aren't raising kids with superpowers. Keeping your kid from eating mostly cookies and decently bathed is hard enough as it is. Still, maybe you can try out a new family venture. The Parr family seems to make it work, we're sure you can too! This adorable little jumpsuit is super simple with attached black boots and gauntlets. Your child might not have invisibility skills but she'll feel sneaky when she's wearing the mask. And there's no need for her to go fight crime along. Looking through our catalog you'll find that the whole family can be incredible with a variety of licensed Incredible costume sizes! Violet doesn't have much violence in her, except when she's "having adolescence" but mostly, she's all about a peaceful solution. Her force fields are strong enough to stop the strongest weapons and a falling superjet. That's a pretty awesome way to keep the family safe if you ask us. 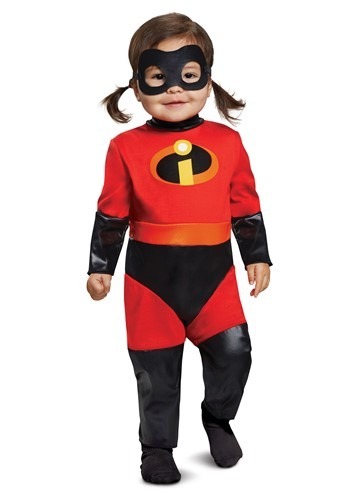 These powers are a lot more manageable than wrangling an explosive infant, nothing against Jack-Jack or anything. And while Violet sometimes yearns to be normal, we adults know that there's simply no such thing. So this Halloween, team together and get in touch with your family superpowers as you unleash your incredible side!